Atria/Garden Prairie provides some of the most advanced commercial aquatic enclosures available. Color-coated aluminum frames and rafters minimize maintenance. Manual or electric-opening light-transmitting roof panels and sliding glass doors allow for natural ventilation. 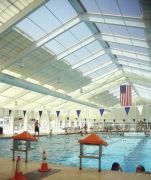 The enclosures increase participation in swimming and club activities at health and fitness centers, YMCAs, schools, waterparks and other recreation facilities. For almost four decades, CCSI International, Inc., manufacturer of Atria/Garden Prairie aquatic enclosures, has been a leader in the development of enclosures for both commercial and residential applications. CCSI is also available for roof-only projects. Aquatons®, the latest creation from Empex Watertoys, are created specifically for splash play areas without standing water. A whimsical presentation of Aquatecture®, they are made of round, flowing forms and are a safe, innovative alternative to spray features of the past. Aquatons® need minimal maintenance and have no troublesome exposed fasteners, valves or levers-children interact with the water flow alone. Products are constructed of strong reinforced composite plastics and are available in a variety of standard and custom shapes with the Empex color signature to create a dynamic and colorful splash play area. Waterplay® offers an innovative splash play area design software that caters to the increasing number of communities that are adding splash play areas as a fun alternative. If properly designed, a splash play area can last for many generations and require little maintenance besides routine equipment checks. The new interactive splash play area design software uses the latest Flash technology and allows users to experiment with various spray toys and park layouts. Whether you are a landscape architect, engineer, parks and recreation director, or community group, Waterplay®'s park builder makes designing a splash play area a whole lot easier. The AquaJogger from Excel Sports Science suspends the body at shoulder level with the head out of the water for normal breathing. Suspending the body in deep water displaces 90 percent of the body's weight, creating impact-free fitness. AquaJogger offers an expanded line of aquatic exercise equipment. Five models of buoyancy belts accommodate a range of body types, and each comes with a 48-inch adjustable belt. Custom lengths are available, as well as a full line of accessories, including resistant barbells and footwear. What sets QuickbloxTM starting platforms apart from others in the competitive swim market is the patent-pending, built-in strobe lights that flash in sync with the start tone so swimmers react to sight as well as sound. The fiberglass World-Class model and the powder-coated, stainless-steel model from USFilter also provide unique handles to give backstrokers a variety of gripping angles, increasing the ease and comfort of starts. Structures Unlimited offers translucent building systems that are proven to be some of the best technology for cost-effective, corrosion-resistant, maintenance-free pool enclosures. Highly insulating, diffuse light-transmitting panels eliminate glare and shadows while providing superior energy performance. Thermally broken panels eliminate condensation and provide even greater energy savings. Motorized roof panels can be added to permit up to 40 percent of the roof to open for ventilation. The roof opening is screened to keep out bugs, leaves, twigs and other debris. Sidewalls can have translucent panels similar to the roof or can incorporate fixed glass or sliding glass door units. A trusted source for more than 20 years, Recreation Supply Company offers its new 2003 catalog packed with everything you need for your commercial swimming pool and aquatic programs. The 144 full-color pages include rescue equipment, fitness gear, pumps and filters, deck equipment, and more. 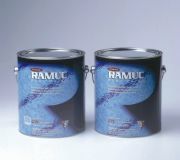 Ramuc EP Hi Build Epoxy offers durable, long-lasting protection for concrete, plaster, granite and fiberglass swimming pools and spas. EP Hi Build is also effective for renovating fiberglass slides and is resistant to stains, chemicals and abrasions. Packaged in an easy-to-use, one-to-one mix ratio, Hi Build rolls easily and builds to 10 ml dry per coat, smoothing rough concrete and plaster, and extending the life of existing surfaces. Two coats of Hi Build cost less than two-thirds the cost of replastering or fiberglassing your pool's surface and lasts at least eight years. Choose from white, dawn blue and beach beige.